The churchyard extends to about two acres and ecologically it is a natural conservation area. It is managed to maintain a balance between wildness and excessive tidiness. The Parochial Church Council is responsible for its management and relies entirely on voluntary help for its upkeep. If you think you would like to help, please get in touch with Mike Paulson, telephone 540 108. In the churchyard there are some 1600 burials post 1900 and an unknown number prior to that date. 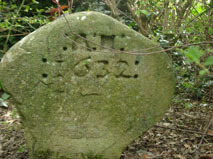 The oldest tombstone, a small very simple stone, is dated 1632. There are several interesting chest-tombs dating from the late 17th and early 18th centuries, and many interesting Victorian monuments. 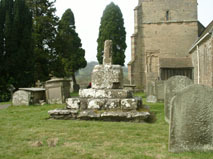 The churchyard cross is old, but of uncertain date. It has steps, base and the stump of the shaft. There is a large area of snowdrops, wild daffodils and wood anemones in the north west corner, and there are about 100 different species of wild flowers, grasses and fungi, and also 95 species of lichen. There is a wide range of bird life, many small mammals, some reptiles and for many years honey bees have lived within the rubble core of the church tower walls.